One of Britain’s most loved groups; Queen brought a flamboyance to rock that it desperately needed, a sense of fun that pricked the serious balloon of the music. Not that they couldn’t make serious music – their albums consistently sold thousands upon thousands of copies, and their 1975 single, Bohemian Rhapsody, is widely regarded as one of the greatest records ever released. 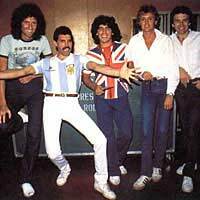 Queen were global stars, but it was at home where they were held in the highest esteem, true superstars, and it’s in Britain that their memorabilia is in the greatest demand. Many fans try to assemble collections of different issues of singles and LPs from around the world (and there’s plenty of variety for them), but this is classed more as record collecting than memorabilia. Others track down whatever memorabilia they can. There’s a huge range of posters, but it’s ones from the early 1970s that bring the highest prices, back before Queen was known. One that stands out is a 1976 tour poster, featuring two nearly naked girls, which was actually banned, and so never used. If you can find a copy of that in good condition, it’s well worth the money, as you’ll easily be able to re-sell it at a profit. Others worth the hunt are a 1973 tour handbill, and a concert poster from 1971, reportedly the first known Queen flyer, when they were eighth on the bill! Backstage passes are the cheapest option, costing £20-25, and you’ll pay more for a concert programme. Depending on age, it should get £30-50, if in good condition. It’s a sign of the way Queen have become revered that some of their memorabilia is likely to be found with big auction houses, like Christie’s. A 2006 auction featured several items, one of the rarest being a set list, written by Freddie Mercury, from 1969, in the formative days before Queen, when he was still playing a lot of covers. It eventually sold for £4,200. An early handwritten draft of lyrics for the song Doin’ Alright, brought £4,800, and even a postcard sent by Mercury to a friend fetched £1,800. If there was any doubt that Queen were in the top echelon of acts, this auction removed them. As the band’s frontman, Freddie Mercury was the focal point, and certainly the best known of the members, with a smaller, parallel solo career. As the most visible, Mercury memorabilia is also the most desirable, as prices have proved when items have come up for sale. Any serious collector might want to snap up the Freddie Mercury doll that hit the market in 2006, and can still be found in the region of £50, although its price is almost certain to rise quickly. At auction you can sometimes find Mercury’s stage clothes, although you’d better be prepared to bid in the thousands to own them. Even a red velour robe he used to wear in the dressing room took in almost £700. In 2005 his Rolls Royce was the subject of the special auction on eBay, with the price shooting well over the £60,000 mark – actually a good bargain for a Roller of any vintage, let alone a 1974 Silver Shadow once owned by a bona fide celebrity. For the moment, prices of Queen memorabilia are quite reasonable. However, the fact the items are being sold at auction indicate that they’re moving up to the next level, making items excellent investments that are likely to realise good profits, even in the short term, as the generation that came of age in the 1980s starts to have the money to indulge in nostalgia. Queen has proved to be the band that won’t die. Freddie might be gone and sorely missed, but with the musical We Will Rock You and a reborn group with Free/Bad Company singer Paul Rogers at the front they’ve been back cranking out the old hits to huge audiences once more.